Like all top notch BBQ houses Lem's is variable, good one day, pretty good the next with the occasional Holy Sh*t that kicked a**, Friday evening Lem's was a-rocking and we came a-knocking. Lem's BBQ is of a style, cooked hot, direct, resulting in a greater degree of fat in the fire flavor gracing crisp, caramelized outer layer, slightly chewy, moist, toothsome, though rendered of internal fat, interior. If the spare ribs were good, the tips were, if possible, even better. Meaty, perfectly rendered of all internal fat, yet retaining juicy distinctive pork goodness. Hot links rocked as well, though it seems to me the links we had Friday were different, better - or at least more to my taste, with coarser grind and more aggressive spicing than in the past. Either way, links = very good, Lem's = Smoking on all 8-Cylinders. I should point out my enthusiastic appreciation of Lem's in no way detracts from Honey 1, Uncle John's or Barbara Ann's, all top notch BBQ. I must say, I enjoy your pictures almost as much as eating the food itself. Always a pleasure. Oh wow Gary, has anyone ever told you about how NY has never heard of a hot link? This makes me want to order a box of Uncle John's product right now. Do you think they'd FedEx ok? Look for previous posts re Peoria Packing's Uncle John's Hot Links. Maybe they will ship you some. Gary, I have noted in the past Lem's courser grind links. They seem to come and go, for some reason. The course grind really works better than the medium (Moo & Oink) or fine (the Texas-type Polish/Czech stuff) for me. Some folks just don't understand the appeal of collagen and fat. Man, oh man. I've died and gone to heaven. My bride is travelling around the city giving flu shots at diferent Walgreens and this gives me the chance to join her and try different restaurants. I attempted to call but received a message that the line was being checked for trouble and a drive by later, just before 9, had the shutters closed and the lights out. Which was open tonight until 2. The choice was made. I picked up Lindy and we headed over, we decided to grab an order of tips and links and head home to eat (instead of eating in the car). I know there has been discussion about the quality of Chicago BBQ but I am sure a visit here would convince anyone that good BBQ can be had. This was confirmed by a coworker of my wife who lives in the area. The ribs had a great hickory smokeyness, a lot of meat on the tips, not fatty at all and very juicy. Absolutely the best tips I ever had. The links were split lengthwise allowing some sauce to coat the inside. The grind just right. Just a touch dry. A satisfing snap when bitten into. They were doing a brisk business with a steady stream of customers with 4 employees behind the counter. I am sure the volume of business should insure fresh food. I will have a very tough time going anywhere else to get my BBQ fix. OK now. Perhaps I am beating a dead pig but I brought dinner to my folks a few days ago. I had mentioned to them that I had found the best BBQ in the city. Besides the usual outstanding links and tips I ventured to get a slab as well (my dad’s preference). The ribs were a touch dry and not as meaty as the tips. I think the huge orders of tips are the primary purchase option and the slab might tend to sit. Another awesome family meal based on recommendations of this board! Thanks! Panther, my experience with Lem's is that when they're on, they have the best ribs in Chicago, hands down. However, due to the fact that Lem's sauce is pretty thin and light, its hard to cover up the fact that sometimes their ribs get overcooked in their aquarium smoker. You always roll the dice at Lems. Sometimes you win, sometimes you lose. While I was at Lem's I grabbed a menu to share. Just got Lem's last night for the first time. Boy, it was good! The links were a little too crisp for me, but the ribs were great and the rib tips were heavenly! I love their sauce too, spicy and sour and well as sweet. And their cole slaw was pretty awesome too. What a great, friendly place. Had nice conversations with other people in line while I waited for them to fry up so fresh chicken for my son. I will definitely go back! Headed to Uncle John's last week to try the brisket and a holiday special of prime rib, but pulled the ol' Milwaukee magic trick (turned into a bar) and did not get there until ever so slightly after 10pm, which is mid week closing time. Ended up at Lem's for stellar coarse ground links, meaty moist tips and absurdly crisp/delicious french fries. Sula thought the tips could have used a little more time in the smoker, I liked them as is. We intended to have a few drinks at the New Apartment Lounge prior to Uncle John's, but somehow, even though we had both been before, missed it. We ended up at Laristo's, a nightcluby bar with a DJ and karaoke, both mercifully absent mid-week, that proved a very convivial spot. Randy Malone, the gregarious bartender, spun a tale or three and introduced us to his signature drink, the Double F.
This kind fellow, sensing we might overindulge in Lem's tips and links, offered us a weight bench he had for sale. But didn't seem surprised when we declined and went on his way. Thanks for the the Great Pix, all. Now i'm starved for Lem's (best Tips in Chicago BTW). To bad they open so late 2pm, puts a damper on a nice rib lunch. 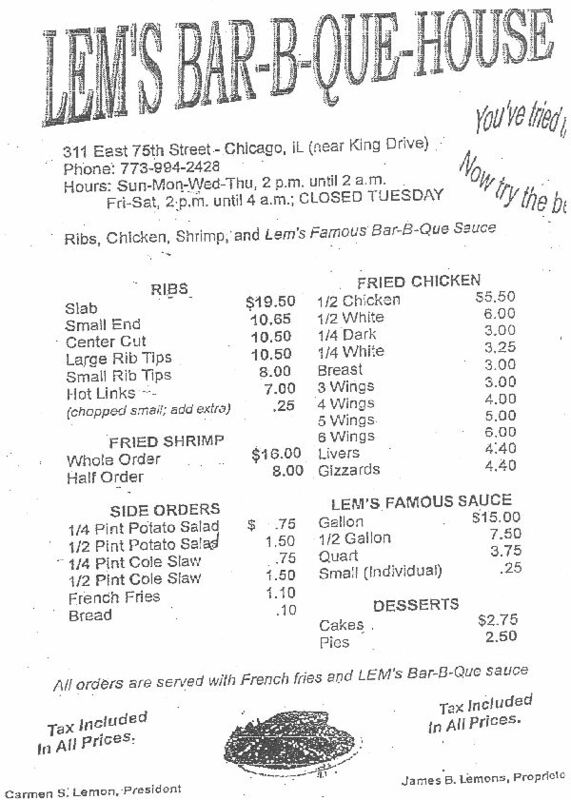 Went to Lem's yesterday on a friend's last day in Chicago. I haven't had good rib tips in so long. I was actually very surprised with how simple the menu was. It was great, because you don't have to wonder what to get without being torn by another choice. Although, I wish they had a rib tips/wings combo, but I'm sure they can accommodate. The people there were also very nice. The food is fast. The change is rounded to the nearest quarter. All pluses. lmao! That random picture of the dude selling the weight bench is a priceless addition to the review, G Wiv! I dunno why. I cannot stop laughing. Foodents wrote: The point we wanted to make is that, yes, often one’s whiteness will be noticed—it by no means happens every time—but that this should never ever stop anybody from experiencing the incredible culinary and cultural offerings of the South Side. White people generally get freaked out when they are in environments in which they are the only white people. Not always and not everyone, but in general. On the other hand, many if not most black people are often in white majority environments; minority populations by the very nature of things have to deal with majorities more than the other way around. All that is a way better read than the usenet group chi.eats. I'd almost venture it's even better than 4chan's food/cooking board too. LOL. That's about right. All food journalism starts somewhere, and with everything running in parallel, it's almost more entertaining when no development or perspective is gained on the journey. Still, I can't wait to see what they write about Smoke Signals. I'll bring it back to the subject. Lem's is pretty much the only BBQ I eat in Chicago when I visit. No particular reason, just when visitng relatives on the South Side it's a given that going to get some rib tips and hot links = going to Lem's. There was very little that made me happier as a youngster visiting my family than the hot links/french fires/white bread paper try from Lem's. Noticed Lem's has a web site > http://www.lemsbarbq.com/Home.do and he is franchising out now? A small group of us did a Southside tour this past weekend which included the obligatory stop to Uncle John’s BBQ. I’ve been thinking a lot recently about how many longstanding Chicago food institutions often times get virtually no mention – that it’s almost always more fun and/or interesting for us to hit the new places (what I like to call the “flavors of the day”) than to keep the pulse on the seasoned veterans and what they’re presently producing. Having that mindset and serendipitously passing Lem’s BBQ enroute to UJ’s, I thought it would be fun to do a side-by-side, on-the-trunk taste test of Uncle John’s vs. Lem’s rib tips. The results were fairly surprising. At least on that day, at that hour, Lem’s rib tips absolutely blew Uncle John’s out of the water, being as GWiv so accurately described up thread as “Meaty, perfectly rendered of all internal fat, yet retaining juicy distinctive pork goodness. “. Even though he wrote that back in June of 2006, it was every bit as true today. It should be noted that, although Scofflaw bartender extraordinaire Danny Shapiro may know how to make a cocktail, his BBQ ordering skills leave something to be desired. The tips he purchased from UJs were slathered with BBQ sauce – to me, a gross transgression. But despite this error in judgment, the ribs were unpleasantly chewy and way fattier than their worthy rival’s while having, for some reason or another, a peculiar gassy profile to them. It’s been a number of years for me now since last eating the product at Lem’s and I anxiously look forward to digging into some of their ribs sometime in the near future. PIGMON wrote: a peculiar gassy profile to them. As if cooked on a gas grill? Interesting report, PIGMON. Barbecue is so variable, as we all know, but even I'm a bit surprised that Lem's fared better than UJ's in the tips department. My rule for the neighborhood is that when I'm in the mood for ribs, it's Lem's. Tips & links? Uncle John's. Oh, and I guess what time it is. Lem's is open quite late. There have been a few times I've found myself there after a wedding between midnight and 2 a.m., and maybe it's just the satisfaction of finding late night ribs speaking here, but I swear they taste extra good at that time. Plus Lem's sauce is hand-down my favorite in the city. Love the thinner consistency, the tang, and that clove kick. When I make my own sauce, I model it after Lem's. Seriously. My “gassy” comment wasn’t meant to insinuate that Uncle John’s has started using gas or is entering any sort of petroleum-based product (starter fluid, Kingsford, etc.) into their smoking process. I highly doubt that. But for reasons completely unknown to be, on that day, the tips just seemed to have a distinctively strong petroleum-esque profile to them of which I’ve never noticed before in the 20-ish times I’ve previously tried them. So, I have no idea what was up on this particular outing. I’m not even sure anybody that ate them with me that day would even agree. maxxpaxx wrote: To bad they open so late 2pm, puts a damper on a nice rib lunch. It's worth noting Lem's now opens an hour earlier than they used to, 1pm instead of 2. They're still closed on Tuesday. Very curious to retry Lem's. Those tips killed. As far at their sauce goes, I'd have to say that it certainly carries a more complex and more interesting flavor profile, but the watery mouthfeel leaves something to be desired. UJ's sauce, viscosity-wise, is better. Also, maybe I'm qualified at this point to give the following tip (no pun intended): don't go to Uncle John's on Saturdays around lunchtime. Whenever I've gone during the week at a random time, the food has been damn near perfect. But, during peak hours, the overall product seems to suffer (with the exception of the links, which are always so so so so so good). backorforth wrote: Very curious to retry Lem's. Those tips killed. As far at their sauce goes, I'd have to say that it certainly carries a more complex and more interesting flavor profile, but the watery mouthfeel leaves something to be desired. UJ's sauce, viscosity-wise, is better. Also, maybe I'm qualified at this point to give the following tip (no pun intended): don't go to Uncle John's on Saturdays around lunchtime. Whenever I've gone during the week at a random time, the food has been damn near perfect. But, during peak hours, the overall product seems to suffer (with the exception of the links, which are always so so so so so good). backorforth wrote: Very curious to retry Lem's. Those tips killed. As far at their sauce goes, I'd have to say that it certainly carries a more complex and more interesting flavor profile, but the watery mouthfeel leaves something to be desired. Yeah, it depends on what you like in a sauce. I tend to prefer the thinner styles, like Lexington-style. Most commercial sauces--if I buy them--I cut about 50-50 with cider vinegar, although the regular Open Pit doesn't need to be cut as heavily. Ugh... another WHY didn't I get here sooner moment. Chicago streetlights don't exactly provide an optimal photography environment, but there they are in their meaty glory This was dinner #2 (post Los Gallos) at 1:30 in the morning, and I still demolished the entire order. Wow. Okay, I'm simultaneously in love with and befuddled by Lem's tips. That amazing texture -- all of the fat and connective stuff having broken down within while the exterior gets so barky and crisp -- seems like it shouldn't work. I know next to nothing about smoking technique, but every time I go someplace that uses too hot a fire (and believe me, those places are ubiquitous in Phoenix :-/), their BBQ always ends up tasting like roasted pork that was waved over some smoky wood. So is it just a matter of threading the needle in terms of temperature, or is there something else at work? A two-stage process? I realize this is trade secret type stuff, but man, I'm curious. Also, put me in the camp that love the sauce. That "clove kick" as described above is awesome. Cinnamon, too? Or is my brain filling that in because of the cloves? Anyway, wow all around.